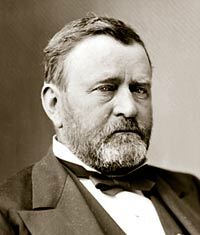 Ulysses S. Grant was an American military leader and 18th President of the United States. Born Hiram Ulysses Grant on April 27, 1822, in Point Pleasant, Ohio, Grant would become the first Ohio-borne man to be elected to the office of president. 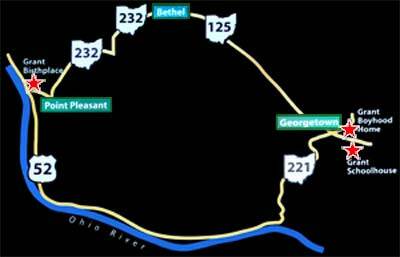 In 1823, his family moved to Georgetown, Ohio. It was in Georgetown that Grant's father, Jesse Grant, pushed his eldest son to excel. Jesse also became a cheerleader for Ulysses, never missing an opportunity to tell fellow townspeople about the latest exploits or accomplishments of his young son. 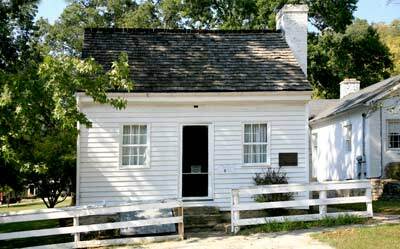 Grant's boyhood home in Georgetown. Grant lived here from 1824 to 1839. 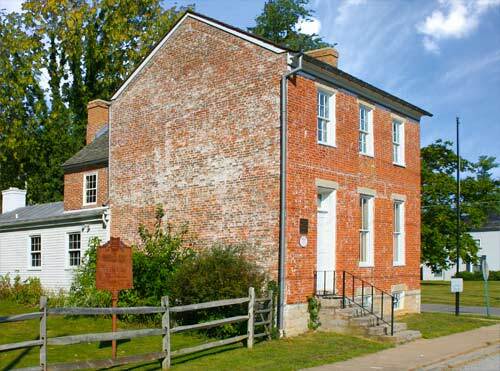 His father, Jesse, built the original part in 1824 and later added on to the house. Grant lived here until he left for West Point at age 17. 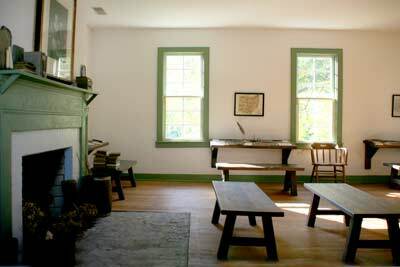 Grant Schoolhouse State Memorial: Built around 1829 in Georgetown, Ulysses Granted attended classes here between 1829 and 1835. When it became known that an opening had become available at the academy, Grant's father pulled all the strings he could to get his son accepted into that vacated opening. This meant appealing to Congressman Thomas Hamer, who had become a political foe in recent years. Rather than hold a grudge against Jesse, the congressman filled out the nomination papers on his last day in office. For whatever reason, the congressman changed Grant's name from Hiram Ulysses Grant (HUG), to Ulysses Simpson Grant. Simpson being Grant's mothers maiden name. Since Grant had long ago refused to accept his given name, he quietly accepted the congressman's error, although he never admitted that the "S" stood for Simpson. From that day on, he became known as US Grant. During his 4 years at West Point, Grant showed a great deal of skill in mathematics and horsemanship. In his other studies he was rather mediocre, and in foreign language a failure. Of a beginning class of around 80 students, only 39 would graduate with Grant placing 21st in his class. His first assignment was in the Southwest. Grant served under General Zachary Taylor in the Mexican War. He remained in the American West following the war. In 1852 after a quarrel with a ranking officer, Grant resigned his commission. In the years before the Civil War, Grant lived much of the time in St. Louis working as a real estate agent and farmer. He failed at both. Grant also helped his father in a tannery business. After the fall of Fort Sumter in 1861, Grant volunteered for duty. He was appointed by the Governor to command an unruly volunteer regiment. He first served as colonel of the 21st Illinois Infantry. Grant whipped it into shape and by September 1861 he had risen to the rank of Brigadier General. In February 1862, Grant led a Union force capturing Forts Henry and Donelson on the Tennessee and Cumberland Rivers. As a result of this campaign, he earned the nickname "Unconditional Surrender Grant" for demanding the unconditional surrender of Confederate soldiers. These were the first major victories of the war for the Union military. Grant continued his advance through western Tennessee in the spring of 1862. In April 1862, at the Battle of Shiloh, a Confederate army surprised Grant and his men. While the North won the battle, Grant's poor performance that first day led to pressure from politicians and civilians to remove Grant from command. President Lincoln fended off demands for his removal by saying, "I can't spare this man--he fights." During the summer of 1862, gave Grant command of all Northern soldiers operating in western Tennessee as well as northern Mississippi. In May 1863, Grant succeeded in defeating a Confederate army under John C. Pemberton. The Confederates retreated into Vicksburg, and Grant's force surrounded the city. After a lengthy siege, the Confederate forces surrendered on July 4, 1863-- the same time Mead was defeating General Lee at Gettysburg. After Grant's victory at Vicksburg, the Union military now had access to the entire Mississippi River and the Confederacy was split in two. With this victory, Grant was given command of all Union forces in the West. In October 1863, Grant's forces captured an important Tennessee railroad junction in the Battle of Chattanooga. In March of 1864, President Lincoln, disappointed with General Mead's lack of action in confronting Lee, Lincoln promoted Grant to Lieutenant General and named him supreme commander of all Union forces. At this time Grant focused all of his attention on Lee's Army of Northern Virginia, leaving the war in the West to his close friend General William T. Sherman. Grant quickly took the offensive. At the onset of the Civil War, other Union commanders had tried capturing Richmond, but were unsuccessful. Grant however, refused to retreat. He realized the North had many more men than the South, were better equipped with seemingly unlimited supply lines than the Southern forces. The South didn't have the men or resources to reinforce their army. Grant directed Sherman to drive his men through the South while he himself, with the Army of the Potomac, pinned down Gen. Robert E. Lee's Army of Northern Virginia. Grant repeatedly attacked Lee throughout the summer of 1864. At battles such as the Wilderness, Spotsylvania, and Cold Harbor, Grant lost more men than the Confederates, but he was able to replace these casualties with additional forces. By early June, Grant had surrounded Lee's Army at Petersburg, Virginia setting up a 10 month siege of the city. Finally, in early April of 1865, the Confederates left Petersburg which led to their ultimate defeat. Gen. Robert E. Lee and the Army of Northern Virginia surrendered his Confederate army to Gen. Ulysses S. Grant at the village of Appomattox Court House in Virginia on April 9, 1865. Following the War, Grant remained in the Army. In July 1866, he was appointed General of the Army. He was the first person since George Washington to hold this rank. Grant also became involved in the conflicts between Congress and President Andrew Johnson. In 1868, the Democratic Party chose Horatio Seymour as its presidential candidate. Seymour, former governor of New York, supported states' rights and opposed equal rights. The Republican Party selected Grant, a defender of equal opportunities for blacks with whites and a supporter of a strong federal government. Grant easily won the Electoral College vote, capturing 26 of the 34 states. In the popular vote, Grant received 53%. The Republican Party, however, maintained a firm hold over the United States Congress. Grant's first term as president was troubled with corruption. Numerous political leaders, including Grant's vice president, were accused of providing political favors for monetary compensation. Grant remained above the corruption, but many Americans faulted him for his poor leadership and lack of control over his cabinet. In the South, violence was also increasing between whites and blacks. The nation seemed no closer to healing its wounds from the Civil War. In 1872 Grant sought reelection and won easily, receiving 56% of the popular vote. Grant promised to end the violence in the South but did little about it during his second term. A growing number of Republicans began opposing equality for blacks and encouraged Grant to withdraw Union troops from the South. An economic depression in 1873 further alienated the American people from Grant. More than 18,000 businesses closed over the next 5 years, leaving thousands of workers unemployed. Due to Grant's declining popularity, the Republican Party nominated Rutherford B. Hayes as president, although Grant had desired to seek a third term. Grant also sought the party's candidacy in 1880, but the Republicans selected James Garfield instead. Grant spent his last years in New York, writing his memoirs. 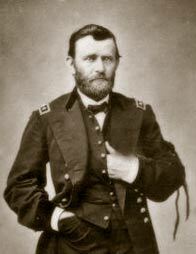 When he was elected president, Grant had resigned his commission in the military. In 1885, the United States Congress reappointed Grant as General of the Army. His salary helped him pay rising bills. About that time he learned that he had cancer of the throat. He started writing his recollections to pay off his debts and provide for his family, racing against death to produce a memoir that ultimately earned nearly $450,000. Soon after completing the last page, in 1885, he died. He is buried in Grant's Tomb in New York City. Grant is pictured on the $50 bill.